In vivo vanadate and vanadyl have been shown to mimic the action of insulin and to be effective treatment for animal models of both Type I and Type II diabetes. The molecular mechanism of action of the vanadium salts on insulin sensitivity remains uncertain, and several potential sites proposed for the insulin-like effects are reviewed. In human trials, insulin sensitivity improved in patients with NIDDM, as well as in some patients with IDDM after two weeks of treatment with sodium metavanadate. This increase in insulin sensitivity was primarily due to an increase in non-oxidative glucose disposal, whereas oxidative glucose disposal and both basal and insulin stimulated suppression of hepatic glucose output (HGP) were unchanged. Clinically, oral vanadate was associated with a small decrease in insulin requirements in IDDM subjects. Of additional benefit, there was a decrease in total cholesterol levels in both IDDM and NIDDM subjects. Furthermore, there was an increase in the basal activities of MAP and S6 kinases to levels similar to the insulin-stimulated levels in controls, but there was little or no further stimulation with insulin was seen. 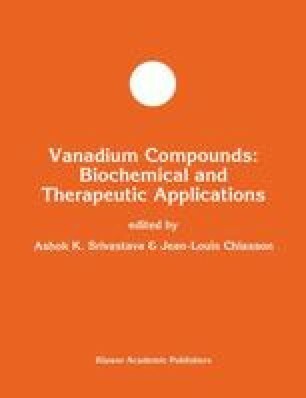 Further understanding of the mechanism of vanadium action may ultimately be useful in the design of drugs that improve glucose tolerance.